Home > Italian Cuisine > Quiz: How Well Do You Know Pizza and Pasta? Pizza and pasta are responsible for making Italian cuisine arguably the best loved food in the world. But how tasty is your recipe and ingredient knowledge? Try these 25 questions in our fun quiz for starters. 1 Which southern city lays claim to being the birthplace of pizza? 2 Pine nuts, pecorino cheese and fresh basil are the main ingredients of which verdant pasta sauce? 3 What is the name of the pasta made from flour and potato whose name translates as ‘small lumps’? 4 Which phrase is used to denote the correct consistency of cooked pasta? 5 What is the crust around the edge of a pizza known as? 6 Naples gave birth to puttanesca. What does the name of this hot tomato, olive and caper sauce translate as in English? 7 What type of flour is typically used to make fresh pizza dough? 8 This grating cheese from the Po Valley area is not as well known around the world as parmesan, yet can perform the same role as a garnish for pasta. What is its name? 9 Which city is recognised as the home of tortelloni? 10 Which pasta known as ‘little ears’ is often married to chilli, anchovies and broccoli? 11 Which pizza bears the name of the queen who is said to have inspired its creation? 12 Which vegetable is added to fresh pasta dough in order to give it a distinctive green colour? 13 Pancetta, tomatoes and chilli are the principal ingredients of which sauce? 14 Rome is considered the home of a creamy sauce that combines pork jowl and eggs, and is inextricably linked with an accompaniment of spaghetti. What is its name? 15 What is the name of a pizza which is formed by folding the dough over to form a sealed parcel? 16 What ingredient forms the centrepiece of a pizza fiorentina? 17 Arrabbiata translates as angry. Which spice is added to the sauce in question to cause this culinary temper tantrum? 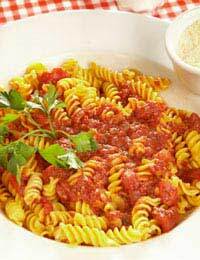 18 Pasta al forno denotes the method by which a dish has been cooked. What is the method? 19 What is missing from a pizza in order for it to be described on the menu as ‘bianca’? 20 Mozzarella is synonymous with pizza. Which type of this cheese, made from cow’s milk, is deemed best suited as a topping because of its more elastic quality? 21 Which two vegetables do Ligurians traditionally consider ideal additions to pasta tossed in pesto? 22 A qualified pizza maker in Italy is given what title? 23 By tradition, pasta is served during which course of an Italian meal? 24 A pizza consisting of quarters, each showcasing different ingredients, is known as? 25 In the pot, gnocchi are ready to be served when what happens? 1 Naples; 2 Pesto; 3 Gnocchi; 4 Al dente; 5 Cornicione; 6 Whore’s style; 7 Double zero; 8 Grana Padano; 9 Bologna; 10 Orecchiette; 11 Margherita; 12 Spinach; 13 Amatriciana; 14 Carbonara; 15 Calzone; 16 A cracked egg; 17 Chilli; 18 In the oven; 19 Tomato sauce; 20 Fior di latte; 21 Green beans and potato; 22 Pizzaiolo; 23 Il primo; 24 Quattro stagioni; 25 They float to the top of the boiling water.